The Karachi Conference has held five successful events- bringing together scholars, academics, and activists to understand one of the fastest growing cities in the world. The Conference was created to highlight significant historical movements and developments that make Karachi what it is today. The conference attracts both local and international persons in an academic setting. 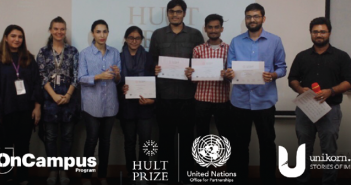 The Fifth International Karachi Conference brought together not only exceptional panellists, but five of Habib University’s brightest minds. Students participating in the conference came from different educational backgrounds, highlighting different regional issues they have experienced. 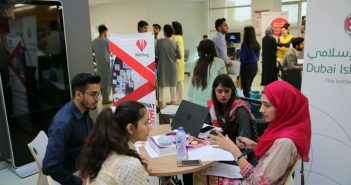 Uzair Ibrahim, Neha Panjwani, Nazish Rizwan, Shafaat Khowaja, and Farwa Hussain shared their experiences of being student panellists in one of Karachi’s most renowned academic events including the topics they discussed. Last year saw arguably two major changes in Clifton, Karachi: one, the construction of the Bahria bridge, and two, the renovation of the Shrine of Abdullah Shah Ghazi. The reason behind these two is the construction of the Bahria Icon Tower. This has fundamentally altered the phenomenology of the place for the residents of that area and visitors alike, especially in relation to the Shrine. In our paper, through field interviews with the local stakeholders, we have found that the renovation of the Shrine is welcomed by the shrine visitors. However, from an archaeological and historical point of view, the renovation of the Shrine, along with the building of the Bahria Bridge, has resulted in the reorganization of urban space, disruption of history and historical sites, environmental and human degradation, and an artificial arrangement into a living part of the city. Furthermore, it would not be far-fetched to claim that the renovation of the Shrine is an appropriation of the Shrine into the Bahria brand aesthetically. We also intend to explore the tension between the stakeholder point of view and the archaeo-historical point of view. It was my first ever academic conference, and the feedback I received was really encouraging. Apart from the panel itself, the audience was also engaging with our research. I was told that my presentation resonated with issues discussed before in the conference. We were asked about the challenges and surprises that we encountered during the course of our research. Our panel was chaired by Dr. Aliya Iqbal-Naqvi, and Dr. Framji Minwalla was the discussant. I also learnt a lot from the other presentations in the conference. This blog was written by Uzair Ibrahim, Class of 2018, majoring in Social Development & Policy (SDP). Karachi’s air pollution problem is inextricably linked to its poor governance and rapid urbanization. The problem is inherently complex, and transcends any one authority that may potentially cure it. A coordinated and well-planned effort with inter-governmental and inter-sectoral collaboration, combined with a strong political will is required if the current state of affairs is to be improved. The fastest growing city in the world is thus faced with unprecedented challenges pertaining to its air quality. Understanding the challenge requires looking closely at the methods of air pollution data collection; the primary and secondary sources of air pollution specific to Karachi, which include a brief history of its transit system; its colossal waste management problem; the city’s industrial base, and its geography and climate. I proposed that Air Quality Management (AQM) should become a national priority, if not an urban emergency. As can be seen, non-engagement with the issue, and letting the situation aggravate is harming every individual and the country at large, as shown by a variety of indicators, such as rise in hospital admissions for respiratory illnesses, smog alerts, haze and dust in the air etc. The policy paper I presented examined what has been done so far by relevant institutions to mitigate air pollution; it’s economic, health, and environmental consequences, and the need for evidence and data collection mechanisms to be put in place, which may potentially motivate policy making for cleaner air in the city. After the presentation, we were asked by the panel chairs Dr. Minwalla and Dr. Naqvi to talk about the challenges or surprises we faced whilst conducting our research, to which I responded that the lack of valid and reliable data collection on Air Quality Indexes was surprising and challenging at the same time, because when neither citizens or policy makers are aware of the scope of the issue, it is very hard to give targeted policy solutions. Few members of the audience also directed their questions to me and I learned to answer them to the best of my knowledge and acknowledge the gaps in my own research. 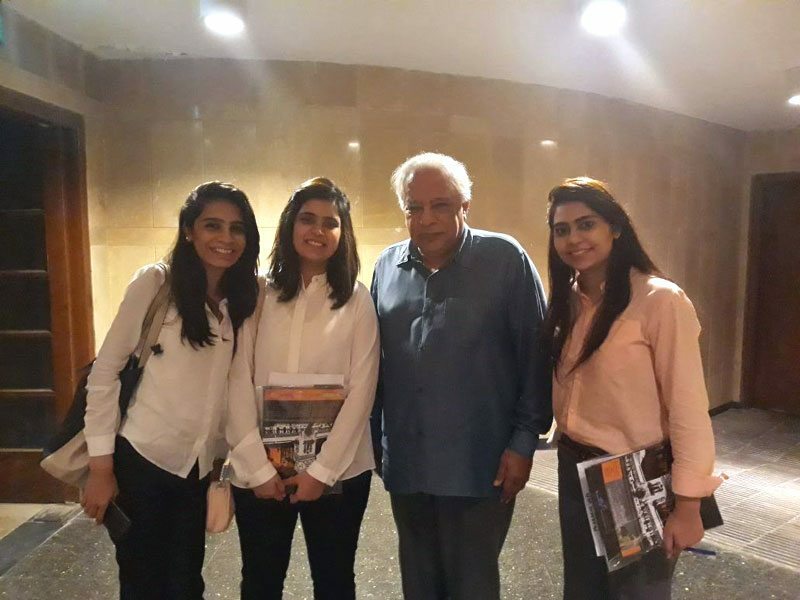 Architect and planner, Arif Hasan, met us outside the auditorium and gave each of us words of encouragement. We concluded the day with an amazing dinner at the Karachi Gymkhana and cheered to our first conference as presenters! This blog was written by Nazish Rizwan, Class of 2018, majoring in SDP. Naya Nazimabad Housing Scheme: A Development Project for Whom? However, the research experience was shared with a limited number of people which included my professor and classmates. When this paper got selected to be presented at the Fifth International Karachi Conference, under the session titled ‘The Best of Karachi Student Research’, it gave me an exciting opportunity to share my research on a public forum and step out of my classroom. It was an honor to present my research paper at an academic conference, and in front of a large audience including senior researchers and scholars…what every young researcher looks forward to. It was an overwhelming experience that gave me an opportunity to see the implications of my work beyond the classroom discussions. It gave me a chance to interact with development practitioners and social activists from all over Karachi, further unleashing networking opportunities for a young researcher like myself. It was definitely one of the very rare special moments when I saw my university professors being there to support us and feeling proud of their students. Moreover, remarks such as “incredible work”, “emerging researchers”, and “these students gave the real picture of Karachi”, were a feather in my cap! It boosted my confidence for future presentations and to engage in many more projects encountering the city’s development and social transformation. This blog was written by Shafaat Khowaja, Class of 2018, majoring in SDP. An average resident of Karachi does not have knowledge of the source and path of the water that runs through their taps. It is not that the data required to understand the water distribution system of Karachi does not exist. The existing data, however, does not help a layman, because a) it is not public, b) it is not user-friendly, and c) it does not account for the cracks in the system. Geographic Information System (GIS) mapping can offer a probable solution to these issues. The process of devising and designing such a solution is complex, reflecting the convoluted nature of the issues and their representations. Karachi’s large number of unauthorized settlements, political stakes with regards to a sensitive issue like water, and malfunctions in the system also add to the difficulty, making the issue all the more strenuous, and therefore, worth studying. 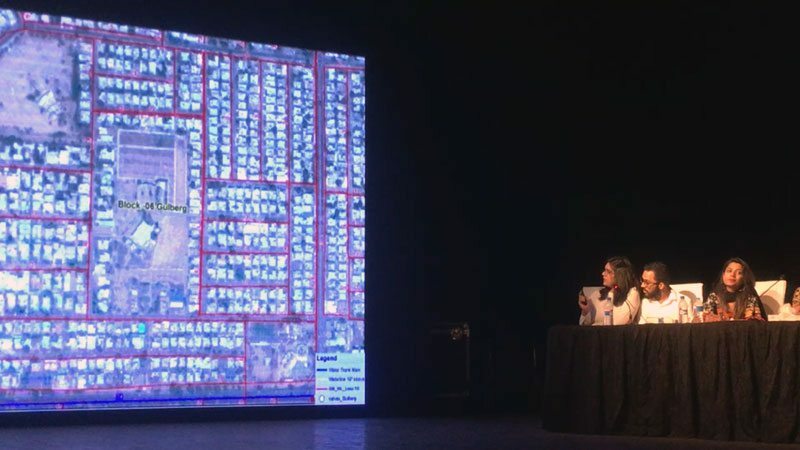 The maps that resulted from this project make use of digital cartographic softwares to subsume all major tributaries, trunk-lines, pipelines, hydrants, and pumping stations, whether legal or illegal. The maps are public, interactive and communicative, allowing citizens to access and understand the information provided. Future prospects of this project include various possibilities which can add more layers of intricate information on the maps. The work that I presented came about from a ‘Cartography’ course that I took in my sophomore year which was conducted by HU faculty member Gulraiz Khan. Through this course I realized that maps are not just charts for representing geographical data but rather they are a vehicle which embed symbols that can mask ideological and material concerns of a society. This was the first time I presented my research work at a public forum. We really appreciated having our faculty members Dr. Hafeez Jamali and Dr. Severine Minot in the audience, as they were very supportive throughout the research process. Dr. Framji Minwalla, who was the moderator, asked about surprise elements we came across during our research to which I responded that the data is not easily available. Moreover, the disheartening element was that when we went directly to Karachi Water & Sewerage Board (KW&SB), the officials did not bother to take us seriously or even talk to us properly. However, when we went through a resourceful person, we received VIP treatment. Post conference, the best feeling was from the appreciation and feedback given to us by our professors. To receive that kind of encouragement was overwhelming. I am hoping to connect with people on this project through the conference. 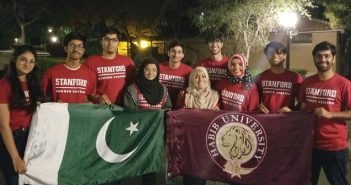 This blog was written by Farwa Hussain, Class of 2018, majoring in SDP. Conversations around gender inequality often focus on access to health, education, and workplace rights, but scarcely concern the transportation sector. The latter is highly gender discriminatory, especially in developing countries such as Pakistan, affecting the mobility of women and third genders, who face inequities in the provision and accessibility of this public service. Such constraints to safe, efficient, and comfortable mobility create serious problems for certain genders reflecting their economic security: this by extension is both a cause and an effect of social inequality, and the failure of federal budget allocation towards transportation leading to profound gender disparities in cities. It not only affects mobility but also, consequently, shapes the way in which space is occupied by women in public spheres. In the light of these challenges, my policy paper sought to highlight the specific mobility challenges faced by women and transgenders, in the metropolis of Karachi, who commute via public transport that includes buses, taxis and rickshaws. It highlights existing shortcomings and recommends an urgent focus on a more inclusive, need-based public transportation system. By drawing on the principles of gender mainstreaming interventions in public transportation in other countries, and data from first-hand interviews with local conductors, bus drivers and passengers – this policy makes some pragmatic recommendations, paying special attention to issues of inclusion, accessibility, safety and mobility. The implications of this study are to enhance evidence-based policy-making in transportation with particular focus on urban planning and gender-sensitive city development. Presenting at the prestigious Fifth International Karachi Conference was a remarkable learning opportunity that provided me immense academic and professional exposure. It felt great to see so many of my professors sitting there in the audience to support me; quite frankly such an accomplishment wouldn’t have been possible without their constant guidance. As a matter of fact, Dr. Severine Minot suggested to me to submit the abstract to the committee considering its relevance to local context. Earlier this fall, I had also presented the same paper at an International Conference on Sustainable Development in Rome, Italy but I believe what set this particular experience apart was that it provided me a brilliant opportunity to address the local audience on a mobility rights issue that is very much pertinent to Karachi’s context and yet to much dismay, remains neglected. Through this platform, I got an opportunity to form strategic connections with people in the development sector. These networks will not only help me greatly with my dissertation research but also in future academic and career development endeavors. One of the highlights from the conference: I was approached by a World Bank consultant working on gender and transport issues in Karachi. All in all, I’m delighted this opportunity presented itself to me because it certainly was one-of-a-kind. This blog was written by Neha Panjwani, Class of 2018, majoring in SDP.